On April 18, the Centers for Disease Control and Prevention (CDC) provided a free continuing education webinar as part of its "Tune in to Safe Healthcare" series. This webinar, titled "Lessons from an Outbreak Investigation: Improving Medication Preparation, Use, and Other Infection Control Practices in Outpatient Oncology Clinics," focused on an outbreak of fungal infections in an oncology clinic as discussed below. On May 24, 2016, CDC was notified by the New York City Department of Health and Mental Hygiene of two Exophiala dermatitidis bloodstream infections occurring in oncology patients who had received care from a single physician at an outpatient oncology clinic. Review of Jan. 1–May 31, 2016 microbiology records identified two additional patients with the same bloodstream infections from the clinic. All four patients had implanted vascular access ports and had received intravenous (IV) medications, including a compounded IV flush solution containing saline, heparin, vancomycin and ceftazidime which was compounded and administered at the clinic. E. dermatitidis (previously known as Wangiella dermatitidis) is a fungus that is found in the environment and has been implicated in infections associated with contaminated steroids for injection by a compounding pharmacy in the past. During Jan. 1–May 31, 2016, a total of 153 patients were seen at the clinic, 38 (25%) of whom received an IV medication. No cases were identified among patients who did not receive IV medications. Five of the 17 cases were identified in symptomatic patients who sought medical care for infection or underlying medical conditions. The remaining 12 were identified by screening blood or central venous catheter (CVC) culture. Two of the infected patients died at 10 days and 12 weeks after positive culture, respectively. It was unclear whether the deaths were related to the infections. The 17 patients with a positive culture (by blood or CVC culture) did not share a common chemotherapeutic exposure or a common adjunctive IV therapy (e.g., dexamethasone or ondansetron). However, all patients with or without a positive culture were exposed to the compounded IV flush solution. Assessment of the clinic revealed failures to meet CDC infection control standards for outpatient oncology settings as well as standards for sterile medication compounding and handling of hazardous drugs as outlined by U.S. Pharmacopeia chapters 797 and 800 and the Food and Drug Administration. 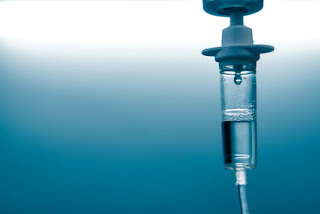 Investigators learned that IV flush bags containing saline, heparin, vancomycin and ceftazidime had been compounded under substandard conditions, stored in a refrigerator and accessed daily for multiple patients over approximately 4-8 weeks until the solution was depleted. This outbreak highlights the gaps in both awareness and enforcement of national and state pharmacy and infection control standards in outpatient settings that perform parenteral medication compounding and infusion service. The Centers for Medicare & Medicaid Services (CMS) continues to keep outpatient care centers on its radar for breaches in practice and failure to follow nationally recognized guidelines and standards. Infection Control Consulting Services (ICCS) specializes in providing a wide range of outpatient infection control services to outpatient clinics and care facilities. These include site visits for "best practices" assessment and improvement, accreditation survey preparation, corrective action plans, development of infection prevention and control programs that align with nationally recognized and guidelines, risk assessments, infection control educational programs and mentoring of staff. To learn more about how ICCS can help improve your processes and procedures, contact us for a complimentary telephone consultation.